Background: The diploid (2n = 2x = 14) strawberry model plant Fragaria vesca ssp. vesca ‘Hawaii 4’ was employed for functional analysis of expressed DNA sequences initially identified as being unique to Fragaria and of unknown or poorly understood function. ‘Hawaii 4’ is prominent in strawberry research due to its ease of Agrobacterium-mediated transformation and regenerability, and its status as the source of the first complete strawberry genomic sequence. Our studies of a set of transformants have documented intriguing, construct-associated effects on leaf morphology, and provide important and unexpected insights into the performance of the ‘Hawaii 4’ transformation and regeneration system. Results: Following Agrobacterium-mediated transformation of leaf explants with gene constructs carried by Gateway® vectors, plants were regenerated using a modified version of an established ‘Hawaii 4’ protocol. Expanding upon the findings of prior studies, we documented that plantlet regeneration was occurring via a somatic embryogenic rather than an organogenic developmental pathway. Among transformants, several variations in leaf morphology were observed. Unexpectedly, a particular leaf variant type, occurring in ~17% of all regenerants independent of construct type, was found to be attributable to tetraploidy. The tetraploidy-associated alteration in leaf morphology could be differentiated from the leaf morphology of diploid regenerants on the basis of a quantitative ratio of leaf dimensions: B/A, where B is the width of the central leaflet and A is the overall width of the trifoliate leaf. 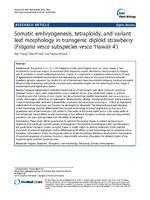 Variant effects on leaf morphology of four different transgenic constructs were also documented, and were in all cases distinguishable from the effects of tetraploidy. Conclusions: These results define opportunities to optimize the existing ‘Hawaii 4’ protocol by focusing on treatments that specifically promote somatic embryogenesis. The reported morphological metric and descriptions will guide future transgenic studies using the ‘Hawaii 4’ model system by alerting researchers to the potential occurrence of polyploid regenerants, and to differentiating the effects on leaf morphology due to polyploidy versus transgenic manipulations. Finally, an intriguing spectrum of leaf morphology alterations resulting from manipulation of expressed sequences of uncertain function is documented, providing a foundation for detailed studies of the respective genes and their functional roles.